Bathroom remodels are tricky to get right. Limited by a small footprint, every piece need to serve a purpose and blend with the other selections to keep the room from feeling too busy. Here is a Part 1 of a step-by-step guide to planning the design of your bathroom remodel. Think about function. Do you need a bathtub? Do you have the space to have a separate tub and shower? Many people now are moving away from tubs in favor of walk-in showers. If you are not a soaker, and already have a bathtub in the house, consider the ease of use, especially in older age, of a walk in shower. Do you need two sinks, or will one suffice? Do you need storage for linens, towels, and products? How much? The bathroom vanity is the most dominant piece in the room, so it's best to let this piece set the tone for the design. Do you want a painted or stained vanity cabinet? Custom or off the shelf? In the kids' bath here in our little blue cottage, we started with the Pottery Barn Classic Double Console in white. 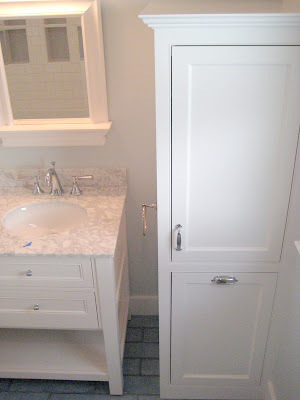 We then added a custom laundry chute cabinet with extra storage for towels above, designed to match the vanity. The chute drops down to a hamper in the laundry room directly underneath this bathroom. Countertops and flooring are of equal importance in a bathroom remodel, but since you have far more options in flooring, it's best to select the counters next. The Pottery Barn vanity above came with a Carrara marble top, which made this selection easy. If you went with a custom cabinet, you'll need to pick a stone. A lot of people think stone is only shiny granite, but there are tons of options out there, from marble to soapstone to travertine. If you go with granite, try a honed finish for a softer, more matte look. For a great bargain, shop for stone remnants from your local supplier or fabricator. Often, they have pieces left over from larger projects that you can get for a steal. Always take a small sample, you'll need it to take it with you when you're shopping for tile. Coming up next -- selecting bathroom tile, sinks, shower fixtures, and accessories. A rich,elegant looking bathroom. The simple lines and clean white lines make it seem like there is plenty of room for everything! I especially like the laundry chute! 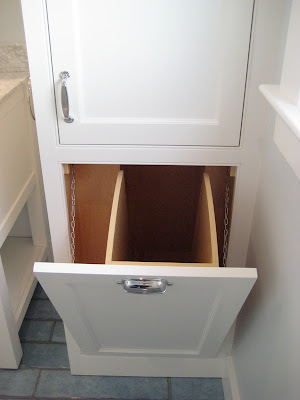 I know someone who has been looking at ideas for the cabinet space and chute all in one like yours so I'll definitely be passing this along! I agree with Debbie. A very sharp looking space. I especially like the tile in there. Defiantly not typical, at least not here in Pagosa Country. I just posted a blog where I remodeled part of our house to make room for our new wood cook stove that you might like to check out. love the laundry shoot w/ storage above. The laundry chute is ingenious. So incredible that I'd prefer to call it a Smart Waiter. Great information - will be useful for when we renovate the bathroom. Useful info, thanx for sharing! Great job with the bathroom! Ultra-modern, but with enough humani character to make it unique. For the counters, I used granite instead of marble. Granite is definitely the premier countertop surface these days. Lowes has some great granite vanity tops made by a company called Jackson Stoneworks. Thanks for guiding us so well and that too with the help of nice illustrations. Bathroom remodels have quickly become one of the most creative projects to tackle in home remodeling, the sky really is the limit in creating great solutions in bathroom design. Wonderful remodeling designs shown above. I am just stunned to watch such outrageous picks. Love the Pottery Barn Classic Double Console in white. This is great inspiration for bathroom renovation. Thank you for posting the pics. Your bathroom looks very neat. The cabinets are also perfect for your bathroom. Cool designs. Your bathroom looks very elegant. I can't deny that those design and concepts are all good. The modernization of design was there and the elegance of the room was also there. Thank you for sharing such information like this. There are many different things that need to be considered before starting your home remodeling project. In this guide you will learn the following top seven things that you should consider before your remodel your home. Look how great you have made. Lots of consideration were being noticed, like the color was a unisex one and the design as well. Thank you for sharing your creation. This is very timely. I've been planning to have my bathroom be remodeled. And these bathroom layouts are undeniably good. Thanks for sharing it. Thanks for sharing the information regarding the bathroom remodeling.. It's a great help to me as I was looking for it so that I can remodel my bathroom in a very nice way.. Your tips are very helpful and I will definitely look forward to it..
Bathroom remodeling will be needed and this actually helps in making the entire home look great. There will be many remodeling ideas and you should implement the one you feel is best. I got to admit that this is great stuff. Wow, This is the great blog.First i tell you, Your bathroom looks very elegant.You are right, I agree, Countertops and flooring are of equal importance in a bathroom remodel, but since you have far more options in flooring, it's best to select the counters next. 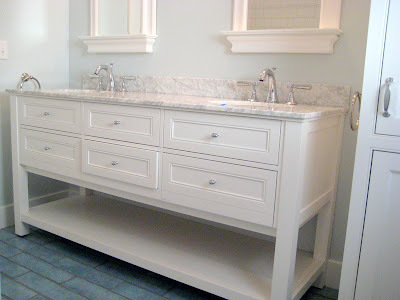 The Pottery Barn vanity above came with a Carrara marble top, which made this selection easy. Thanks for nice posting. Get Do-it-yourself information on Bath Renovations Ideas, Bath Design Tips, Bathroom Remodeling Tricks and Bathroom Trending Info. Also we have Product Reviews and Interviews with Professionals in the bathroom industry to give you some of the best bathroom information online. What I really liked about this blog was your focus on doing what makes sense for your family when doing bath remodeling. If you don’t use the tub, replacing it with a shower will free up some space and offer an easy-to-use option for older homeowners. There are even double size showers suitable for two people. You can add a seat, which is great for seniors and for those who like to turn on the hot water and enjoy a sauna effect. You probably wouldn’t want to remove all tubs though, as future home buyers might consider this a detriment. Love the chutes and the vanity! We do bathroom remodelling to why not come over we are fast and friendly. You can always do it yourself as well where just experts. I love your bathroom! What type of floor tile did you use? Where did you get it? Don't forget that if you are remodeling, bathtub/tile refinishing is a great option for a lot of people. Technology has really improved. New surfaces cure in 2 hour, won't peel or crack, and will realistically provide 5-15 years of service at a price 80-90% less than replacement. It also provides same day service as opposed to 4-5 day service using 3-4 different contractors. No mater your budget, its an option I think people should at least consider. Very nice model and useful info. Take your design from Section 1 and look for wholesale prices on materials. Inquire with retail suppliers about classes to teach you to install tile, toilets and tubs. Discuss with a contractor what your dream bathroom would cost. Get several quotes and have them break down the total cost by labor and materials. While labor is a considerable cost, finding your own supply of materials may greatly reduce the quote. As you discover the real cost of your bathroom, look at the actual cost you can--or are willing to--spend on the bathroom. These are great tips for bathroom remodeling since it is a good idea to choose the right materials and furniture that is suitable for the bathroom. Thanks for sharing these concepts with us. I like the valuable info you supply in your posts. I will bookmark your blog and check again here repeatedly. A rich, elegant looking bathroom. The simple lines and clean white lines make it seem like there is plenty of room for everything! A well-decorated bathroom will be a wonderful start to a morning as you take that shower to start your day. It will help in setting the mood to provide you with the much-needed beautiful start to a busy day. Glazed ceramic tile, mosaic tile and glass tile are popular choices. Marble, slate and granite are elegant in a bathroom, but these materials tend to be pricey. Quarry tiles are unglazed and unsuitable for a bathroom. This is very details step by step guide for remodeling, i learn a lot after reading this post, its great that you keep the good work. That chute is so creative! Too bad we don't all have laundry rooms right below our bathrooms! @River Oak, wouldn't that be amazing? Some older homes still have them installed.